This image, "Castle View", probably dates from the late 1940s and would have been taken from similar spot on Cavendish Road to the previous image. We can see, for example, the Council's development in Starkholmes on the High Tor hillside. The first phase of houses in Whitewood Way and Shortlands were opened in 1932. When Matlock Council were debating what to call the new roads Remo Tinti suddenly suggested, rather frivolously, that the development should be called Canary View. One can only wonder if he had given the matter any thought beforehand. At the Winter Gardens end of the former Smedley's Hydro is one of the two covered corridors/walkways across Smedley Street, connecting the older buildings on the southern side of Smedley Street with the post-1900 ones on the opposite side of the road. The first of these double decked bridges, not shown on this image, connects to buildings on the street edge close to what is now County Hall's main entrance. It was opened on 7 September 1901 when a new annexe was partially launched. The annexe was to consist of 45 bedrooms and seven shops. The new block was parallel with the older buildings, and a "connection between the two buildings ... reached from the second and third landings of the hydro". Visitors were able to access their rooms easily by using the hydro's lift and then crossing over. The entire project had been designed by the hydro's resident architect, William Doxey. Further bedrooms were added in 1906 and 1910. Here we can see the second bridge which is longer than the first one but has considerably less clearance over Smedley Street. It provides access from the west wing of the main building to the northern block. Unlike the 1901 bridge, it is supported by stone walls or pillars on either side of Smedley Street and the second bridge continues further before joining the hydro buildings. Indeed, the northern side seems to have been added as an afterthought rather than as an integral part of the hydro's design. It was added about 1930. Detail from an aerial photo by Frith, about 1955. The arrows point to the bridges. There used to be another inter-connecting bridge, closer to the Rutland Street/Smedley Street junction, which was only a single decked walkway. It can be seen on VLA4952 and on the ninth image down on Bank Road & the Steep-Gradient Tramway. It is not known when that bridge was removed but there is no visible sign on the stonework today. 1. 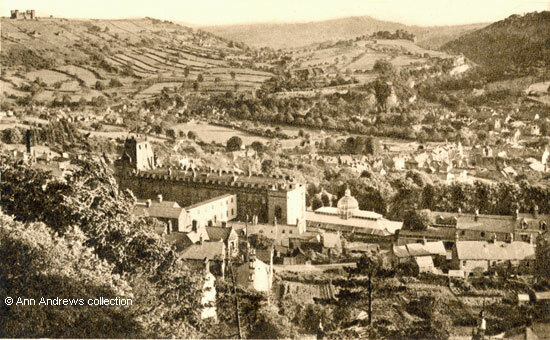 "Matlock, Castle View". Photochrom Co. Ltd., Graphic Studios, Tunbridge Wells, Kent, Publishers to the World. No. V969. Not used. Another of these cards was posted in 1950. 2. Detail from "Smedley's Hydro, ca 1955" published by Francis Frith. Also Ann Andrews collection. "Derby Daily Telegraph", 20 September 1932. "Derbyshire Times", Sat 14 September 1901. Extension at Smedley's. To Avoid Sleeping Out. £11,000 expenditure. Mr. Doxey died in 1907 and was succeeded by his son ("Belper News", 20 September 1907).